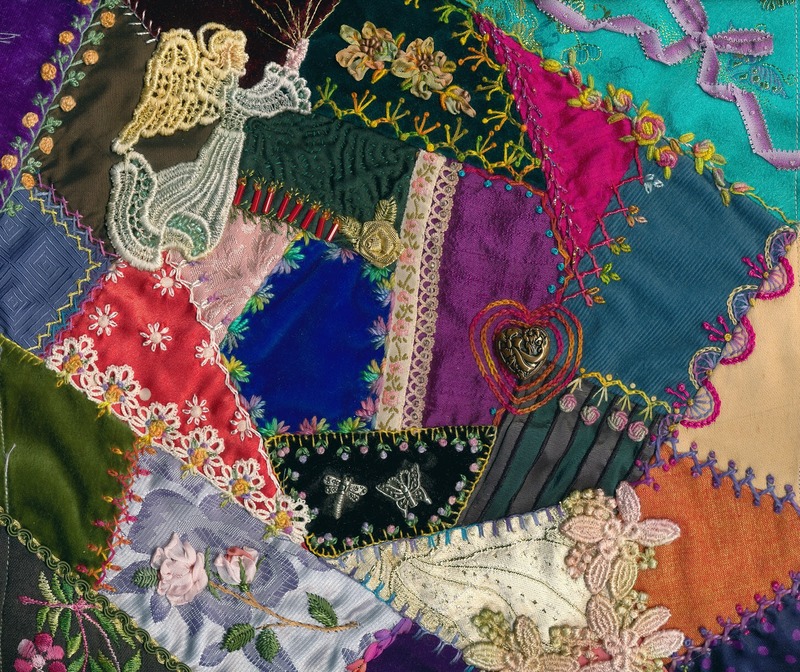 I have retired from full-time work.........yayyyy, clapping hands.........so at last I can get back to my crazy quilt which I started over five years ago. I have just finished the first four blocks with about twenty more to go. I have put my cream-on-cream crazy quilt on the back burner for now because I need to remove all of the gold brass charms and replace them with gold thread embroidery. 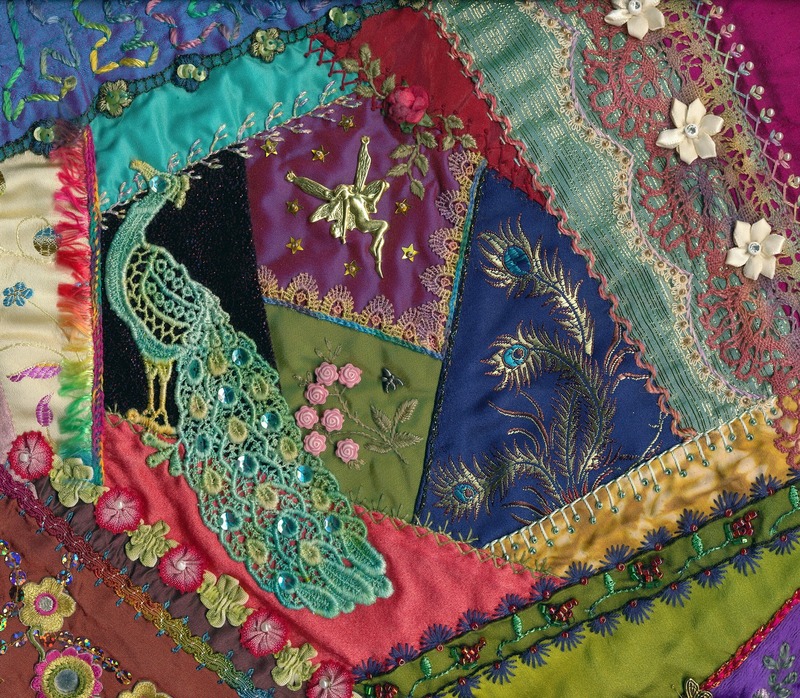 As the charms tarnish and go dull and dark, there is no way that I can clean them without marking the cream fabrics and laces - I don't know what I was thinking of, putting metal charms on the blocks. To see the cream-on-cream blocks check out the post for May 22nd 2011. So I am back to the coloured one and I'm really having fun. I have no idea when I start stitching just what I am going to finish up with. It's like the blocks are telling me what they want putting on them next. 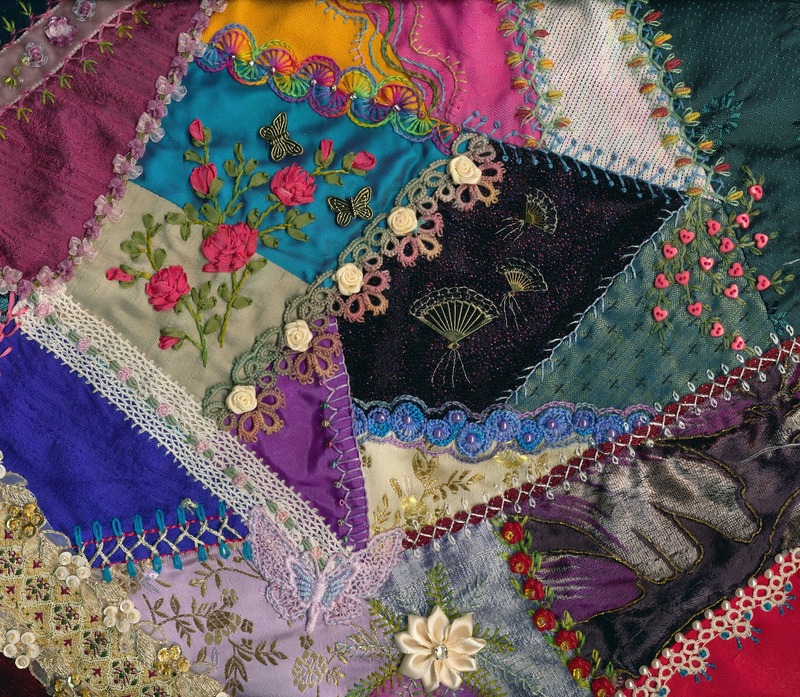 Here are photos of the first four blocks which may all get sewn together into a very colourful and busy crazy quilt or they may get separated by strips of black velveteen fabric. Definitely NOT black velvet though or the house and my nose will be full of little specks of velvet pile. Block One. Peacock is hand-dyed and sequins added to his eye and tail. I thought he went well with the Peacock Feather fabric to the right of the bird. Block Three. 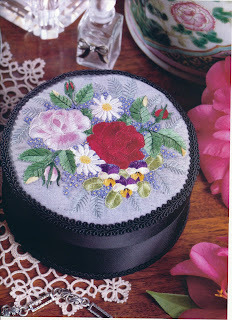 Floral Bouquet Block. 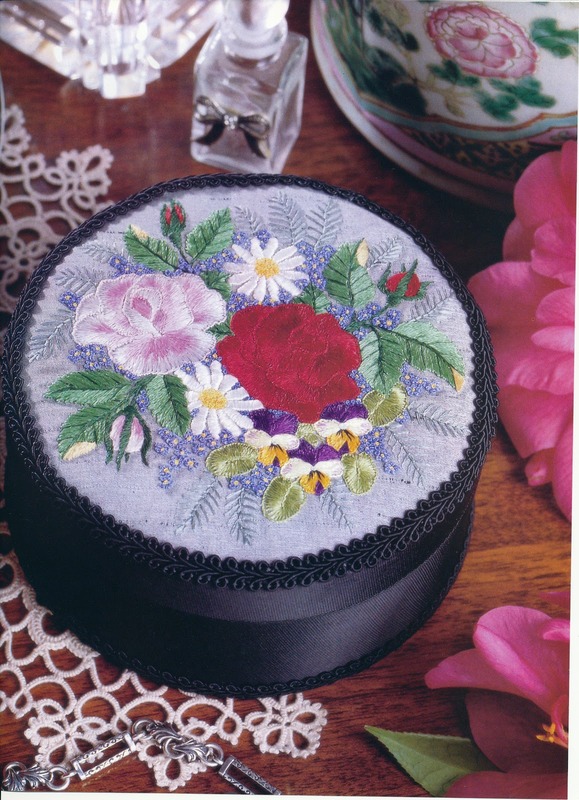 The floral embroidery in the centre was recycled from the lid of a trinket box which I did for a magazine article featuring Rajmahal Threads. 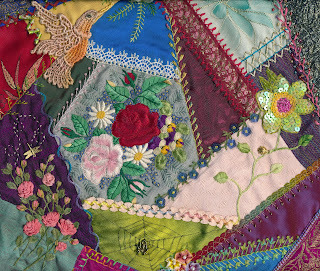 The embroidery was all worked in a single thread. When the black fabric box got shabby from use, I unpicked the lid and used it on this crazy quilt block. Block Four. Fans Block with some gold metal fans which started life as a pair of earrings. The blocks are beautiful, Viv. It's going to be lovely when it's finished. Viv, I too agree about the velvet. See I was going to attach my various RR CQd hearts scattered onto dark green or black velvet but hate stitching on it. Then I found this neato satin (not quilt sure that's what it is but it's bridal fabric) that is a medium green but has a sheen of blue to purple or wine depending on how you look at it. It's perfect and no stretch at all so should hold the CQd hearts very well when anchored with interfacing etc. Can't wait to see your blocks together and glad you're retired now to enjoy it fully.